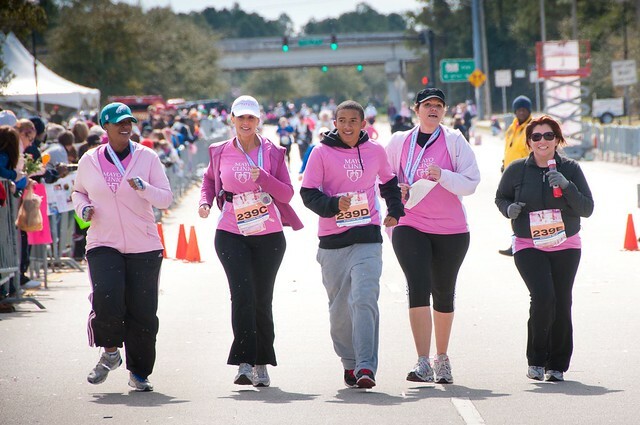 (left to right) Claudette Goode, Margaret Russell, Leel Williams, Karla Phipps and Karol Rojas approach the finish line of the 2012 26.2 with Donna race in Jacksonville, FL. The sixth annual 26.2 with Donna: The National Marathon to Finish Breast Cancer is less than two days away and many of the 10,000-plus participants are anything but seasoned athletes. Take Karol Rajos, a Mayo Clinic employee, who wanted to find a way to honor her Aunt Esther, a breast cancer survivor, and her grandmother Ninita, who passed away from the disease. The annual marathon held each February seemed like a good outlet. So in 2011, Rajos ran her first half marathon. In 2012, she joined forces with her son, Leel Williams, fellow co-workers Margaret “Peggy” Russell and Claudette Goode, and former Mayo employee Karla Phipps, to become a relay team known as 4 Divas and a Dude. And on Feb. 17, the quintet intends to once again lace up their sneakers and run – but this time, they will all tackle the half marathon. For Rajos, the experience has been heartfelt. Last year her aunt travelled from her native Nicaragua, just to watch Rajos run in the event. “It was amazing for her to see she that was not alone – there were so many other women going through the same thing,” Rajos says. Rajos and her teammates are not shy about sharing their experience with others, encouraging colleagues and friends participate in the annual event. There is still time to sign up. Visit the marathon website for more details. Editor’s Note: This is the final story in a series of four stories about the 26.2 with Donna: The National Marathon to Finish Breast Cancer. The 26.2 with Donna is the only marathon in the country where all of the race proceeds and donated funds go to breast cancer research and care for those with the disease. Mayo Clinic receives 70 percent of the funds. Almost $1.9 million has been contributed to Mayo Clinic in the past five years.